We offer private labeling for businesses wishing to have us process their meat under their own logo or name. Each label has the name of the business, the product, and, most importantly, the U.S.D.A. inspected logo. 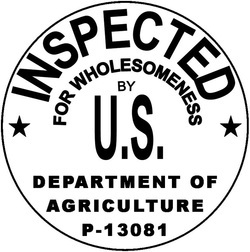 We are able to offer USDA Inspection for Beef, Pork, Lamb, Elk, Buffalo, Emu and others. We currently have the technology to create lables with your logo and name to be printed as the meat is being processed. Individual packages can have the weight and cut of meat printed on the label as it is being packaged.